What does the Old Mutual Two Oceans Half Marathon ballot or draw mean? Runners will be required to submit a ballot application via the OMTOM website, followed by two sets of audited, computer-generated random draws. You will no longer get your entry on a first-come-first-served basis due to the high demand for places in the race. In short: you will apply, go into an audited draw, and then get an entry if your name is chosen in the draw. In order not to lose your entry, you need to pay and submit all outstanding info by the stipulated dates. Find these dates by going to Events/Half Marathon/Entry Info. How will the Half Marathon entry system work for 2019? 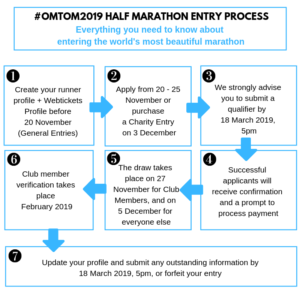 The ballot system (draw) is an application process whereby should you want to participate in the Half Marathon, you will have the opportunity to submit your application – or interest to enter – through the online applications system via the OMTOM website. An application is not an entry. The application link will be on this OMTOM website on the homepage during the application window, and will also be posted to social media. You have a whole week in which to apply. Blue and Yellow number holders will receive an exclusive, non-transferable invitation to enter and pay for their entry from 8 November until capacity is reached. There are 1 300 entries available in this pool. Blue and Yellow number holders who do not meet the 5pm payment deadline on 30 November, or fall outside of the 1 300 entry limit will be added to the ballot. Step 1 – Apply: Runners interested in participating in the Half Marathon must submit their online ballot application between 20 November and 5pm on 25 November 2018. You must also update their details during this time. This application does not guarantee anyone of an entry, and your chances of being drawn are equal, regardless of whether you submit their application on 20 November or 25 November 2018. However, verified club members have two chances to be drawn. Step 2 – Draw: Two audited, computer-generated random draws will take place on 27 November 2018 for paid-up, licensed members of any South African running club and 5 December 2018 for the general public, as well as running club members whose names were not drawn on 27 November 2018. If you do not meet the payment deadline, you will forfeit your entry. If you’ve been unsuccessful in your application, you’ll receive an email notification after the draw closes, inviting you to secure a charity entry, or to secure a substitution entry between 9 January 2019 – 18 March 2019. How much does it cost to submit my ballot application? It’s free of charge. You only pay if your name is successfully drawn. Why did you make this change? An entry ballot is not always a popular option as athletes feel the entry process is out of their control. There is a massive demand for Half Marathon entries, and these entries have sold out within a few hours in the past few years. However, with this incredible demand (which is much higher than the number of entries available), came much frustration. Runners were met with a number of technical difficulties that stood between them and a coveted entry, including slow internet connections, a delay in the bank OTP being sent to entrants, the system struggling with the sheer number of entrants rushing to stake their claim on an entry, as well as runners who missed out on a small entry window due to work or life commitments. After significant research, extensive feedback from participants, and consultations with our Two Oceans Marathon NPC Board and sponsors, we came to the conclusion that a ballot system would be the best way forward. Not only does it place us on par with other iconic global events such as the New York Marathon and London Marathon (both events use a ballot system); it also offers you a smooth, inclusive, fair and audited process without the rush associated with a first-come-first-served system. With the ballot system, you have a week to submit your application, and a five-day window to process your payment. Look out for the link on our homepage at www.twooceansmarathon.org.za during the 20 – 25 November application window, and click. The link will clearly say ‘Click here’. The link will also be posted to our social media pages. What payment methods are there? What are my payment options? Credit cards, Masterpass / Zapper, Visa checkout, any Pick n Pay store using cash, card, smart shopper points or PnP gift card. Unfortunately, no EFTs are accepted. But the great news is that Webtickets is the OMTOM’s official payment partner. This means that, instead of paying within the entry system, you will be redirected to Webtickets, where you can select your preferred payment type. You can therefore pay using credit cards, Masterpass / Zapper, Visa checkout, and any Pick n Pay store using cash, a debit card, Smart Shopper points or a PnP gift card. Note that your in-store payment option, Pick n Pay payment barcodes, expire 3 December at 5pm (for athletic clubs) and 10 December at 5pm (for general entries). Also be sure that if you need to extend your Webtickets voucher, you do so within the date deadline. Read more about all your payment options here. Will I stand a better chance of having my name drawn if I submit my application on the first day? No. The ballot is an audited random computer-generated draw that takes place in the presence of an independent auditor. The draw takes place after the closing date for all applications, not sooner. Why don’t Blue Number and Yellow Number holders have to apply? Blue Number Club members have completed 10 or more Half Marathons (or Ultra Marathons), and Yellow Number holders are set to complete their 10th. Sending them an exclusive invitation to enter is our way of honouring long-standing participants who are an ongoing and active part of the running community. Why don't international entrants have to apply? Traditionally we receive approximately 2 500 international entries who participate across our Easter Weekend events. 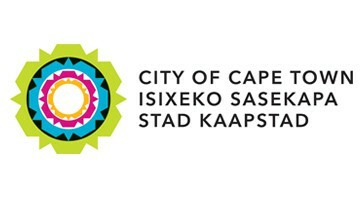 In an effort to continuously improve our status as a world class event – and especially a globally iconic Ultra Marathon – international entrants play an important role in promoting the City of Cape Town as an international tourism and sports tourism destination, which has a tremendous effect on the economic impact on the City itself. All our runners are important to us. However, the current percentage of international entrants is still small enough for us to allow direct entry. As this number grows in future, we will adjust the terms of entry to ensure that everyone has a fair chance to enter. Why are there two draw days? We offer Running Club members the opportunity to be drawn from their own pool. Running Club members whose names are not drawn on 27 November 2018 will be returned to the pool for the general public draw on 5 December 2018. What happens if my name is drawn but I don’t make the payment deadline? First, check that your cell phone number and email address listed on your online profile are correct. 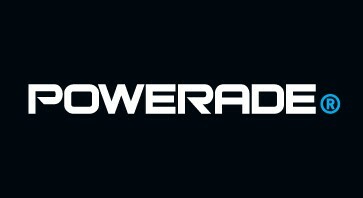 We will send you an email and SMS reminders during your payment window. If you still miss the payment deadline, you will forfeit your entry. It is therefore imperative that you double-check all your contact details on your online profile as one typo will result in you not receiving your email or SMS. Check all payment and other due dates here. Can I apply on behalf of a group of runners, e.g. my club, group of friends, or family? No. While an unsuccessful application now will only affect a particular runner, an unsuccessful group application will affect an entire group of runners. We also believe that applications on individual level make for a fair and transparent process, and that any unsuccessful applicant will still have the opportunity to secure an entry through a charity or via substitution. When will I know if my application was unsuccessful? We will email all affected applicants by 12 December 2018 with an invitation to run for one of our partner charities, or to wait for a substitution entry to become available between 9 January 2019 and 18 March 2019. What is the Half Marathon entry fee? 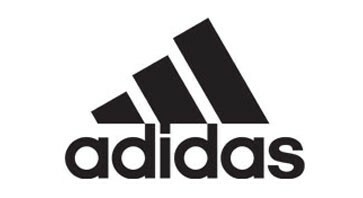 Half Marathon entrants will have the option of purchasing an adidas technical race t-shirt at R345. Runners who do not have a running license will be required to buy a temp license at R60. I don’t have a credit card? Can I pay with an EFT? No EFTs are accepted. We have now partnered with Webtickets as OMTOM’s official payment portal. This means that you can select your preferred payment type – which includes paying either by credit card, or by making a cash/debit card payment at your nearest Pick n Pay. Note that your in-store payment option will expire after 24 hours, so be sure to finalise your payment timeously, or extend your webtickets voucher within the date deadline. Why did you partner with Webtickets? Having Webtickets on board extends our payment options and make the entry system more accessible to a wider demographic of users. The move to an external and more robust payment platform also gives us access to the latest electronic transaction technologies, and ensures that you have more convenient payment options available to you. Almost half of our OMTOM database already have a Webtickets profile. I have a Webtickets profile. Must I create a new one for the entry system? There is no need to create a new profile if you already have one. We do suggest, however, that your email address and cellphone number on Webtickets match the contact details on your OMTOM profile. I don’t have a Webtickets profile? What must I do now? When you are in the “Applications / Entries” tab on your online profile, the second last action is to either create a new Webtickets profile or link an existing one. Click on the link provided, and follow the instructions on the Webtickets portal. I have created a link between my OMTOM account and Webtickets. Can I go and pay at Pick n Pay now? No! Please return to your online profile, click on the “Applications / Entries” tab on the left, and click the pay button at the bottom. You will now be directed to your Webtickets payment portal, where you will have the choice to pay online or in-store. Only when you have selected the in-store payment option (at which point you will receive a voucher number and barcode) will you be able to finalise your payment at Pick n Pay. If you do not select this, there will be no record of you intending to pay in-store, and the cashiers will not be able to assist you. I'm an International Entrant - what must I do? “International entry” is not based on nationality, but rather country of residence. For example: If you work overseas and have a residential address in Africa (outside of South Africa) or elsewhere in the world, you are considered an International Entrant. Similarly, an overseas national living in South Africa will be considered a local entrant. International entrants may enter from the days entries officially open for the respective events, and their entries will be processed until the day before the race. Therefore, if you are an international entrant and local entries are closed, you may email info@twooceansmarathon.org.za for an international entry voucher, which will enable you to still enter. Who can I contact with any additional questions regarding this process? You may call the entries team during office hours on 087 740 5260, or via email at info@twooceansmarathon.org.za.